LODGING ON LEGENDARY LAKE KABETOGAMA! The Pines of Kabetogama Resort is an exclusive, breath-taking 54-acre vacation destination nestled on the peaceful shore of Lake Kabetogama. Plan your escape to The Pines of Kabetogama Resort. An impressive expanse of the Northwoods with an exquisite collection of recently remodeled cabins and spacious RV campsites nestled in the towering pines at the shoreline of Lake Kabetogama. 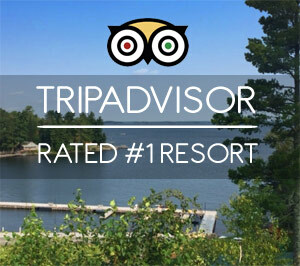 Owned by world travelers dedicated to showcasing Voyageurs National Park and surrounding waterways. At The Pines of Kabetogama Resort, we are committed to showcasing the beautiful “land of sky blue water”. The Pines of Kabetogama Resort is proud to be named the Best Place Stay in Minnesota with Your Motorhome! Choose from six well-appointed cabins perfect for enjoying the National Park and vast waterways. Interiors are impeccably decorated in Northwoods’ theme with local knotty pine and granite. No need to sacrifice luxury at the lake: daily housekeeping; high quality linens and towels are included; luxurious Molton Brown sundries; Keurig Coffee machine; high definition LED television with Direct TV satellite connection; complimentary Wi-Fi; and outdoor dining table and chairs on large deck with charcoal grill. 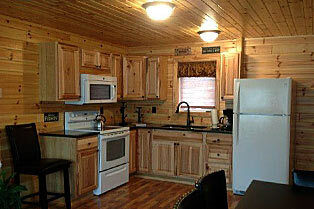 All cabins are air conditioned, and there is onsite coin operated laundry facility. Plus, you have access to our Concierge Services and an electric golf cart for touring our 54-acre estate. Large RV sites located throughout the 54-acre estate. 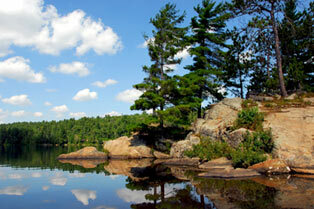 Several sites have a breathtaking view of Lake Kabetogama. All sites have 50 amp electric, water, and Wi-Fi. The majority of RV sites also have sewer. New restroom/shower facility and coin-operated laundry on lake level, there is also a small general store with off-sale liquor. We do offer electric cart rental or take pleasure in our many walking trails. Our new marina offers dock space, gas, ice, and bait. There is a designated area for fish cleaning. Boat rentals are available to resort guests: Pontoon, Lund fishing, kayaks and paddle boards. Our angler’s retreat, located on the shore of Lake Kabetogama, accesses the historical chain of lakes—including Namakan, Sand Point, Rainy and Crane lakes, Sullivan’s Bay and Ash River. 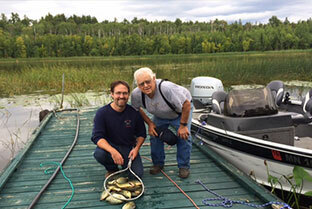 Our resort offers incredible fishing including but not limited to northern, walleye, smallmouth bass and crappie.